In 1916, twelve-year-old Jack Garron’s boxcar-hopping adventure turns into a flight from a ravenous, razor-toothed man who haunts the shadows. 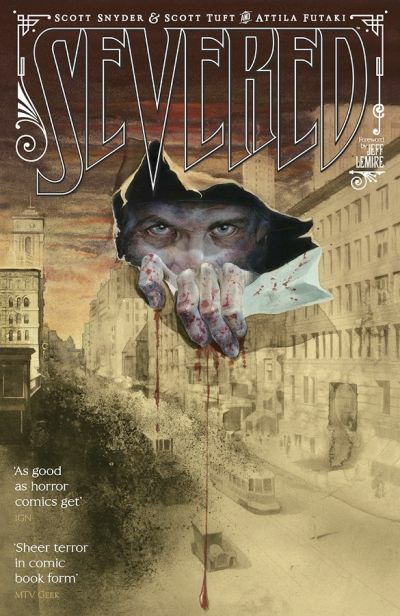 SEVERED (FEB120457), the Image Comics series that captures all of our childhood fear, has been collected into a hardcover collection that will go on sale on April 11. New York Times bestselling artist Attila Futaki (Percy Jackson) matches their story with art rich with historical details and subtle characterization, capturing both the hope of youth and the terror of the unknown. The hardcover collection includes pages originally in issue four of the series that have been re-inked and colored. Snyder and Tuft will both be in attendance at this weekend’s WonderCon in Anneheim, where Snyder will be a special guest. SEVERED is a 200-page hardcover book for $29.99. Its ISBN is 978-1-607065-29-6, featuring a foreword by Jeff Lemire (Essex County, Sweet Tooth). It will be available in comic book stores, bookstores, and online retailers.